Maintaining a healthy body weight reduces your risk of a variety of diseases, such as heart disease and diabetes, as well as helps you look and feel your best. If you want to lose weight, the essential ingredients include a nutritious diet and regular exercise. If you want to lower your body fat, drinking water will help you cut fat in your body by working to curb your appetite and increase your metabolism. Drinking water before your meals can help reduce your appetite, which in turn cuts back on your caloric and fat intake, helping with weight loss. According to a study on water and weight loss conducted at Virginia Tech, drinking two 8-oz. glasses of water before meals helped dieters lose about 5 lbs. more than dieters who did not increase their water intake over the course of 12 weeks. Drinking water before a meal fills your stomach up with a zero calorie, healthy substance, says Brenda Davy, head of the study. According to Davy, people who drink water before meals eat 75 to 90 fewer calories per meal than those who do not. 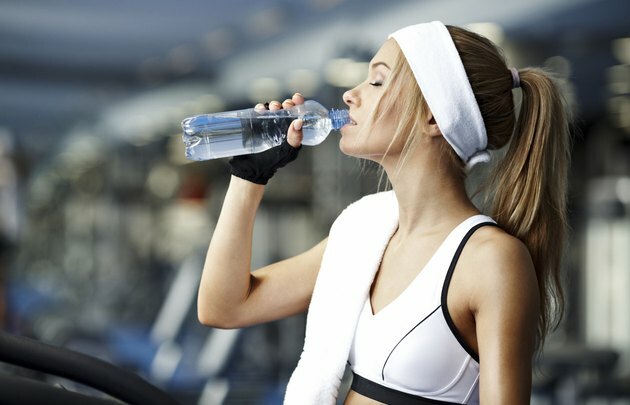 In addition to filling you up and providing a zero-calorie alternative to sugary drinks or beverages, water helps with weight loss by allowing your body to process and expel wastes efficiently. Your metabolism breaks down the food you eat into energy, and your kidneys use water to help process toxins from what you eat and drink for excretion. If you do not drink enough water, your liver is recruited to help process the toxins. Your liver normally converts stored fat into energy, but if it is needed to help process toxins from the dehydrated kidneys, your liver cannot break down fat in your body. Water can help you lose body fat by flushing fat from your system and keeping your metabolism running smoothly. Water is necessary for all your basic body functions and allows your blood to carry nutrients during the metabolic process. According to a study conducted by German scientists and reported in "The Journal of Clinical Endocrinology and Metabolism," drinking 500 ml of water increased metabolic rate by 30 percent in men and women subjects. There is no set recommendation for the exact amount of water you should drink every day, but obeying your thirst is a good general rule of thumb, according to Virginia Tech professor Brenda Davy. The Institute of Medicine advises adult men to drink about 3.7 liters -- about 13 cups -- of water a day and adult women to drink about 2.7 liters -- about 9 cups -- daily as a general guideline.